Many times I pick up a pattern and rather than giving me a hook size that I’m familiar with — which here in America that is usually a letter A – N or a number for the smaller thread hooks ie. 00, 0, or 1 – 14 — sometimes, the pattern simply gives a metric number, such as 3.75 mm. 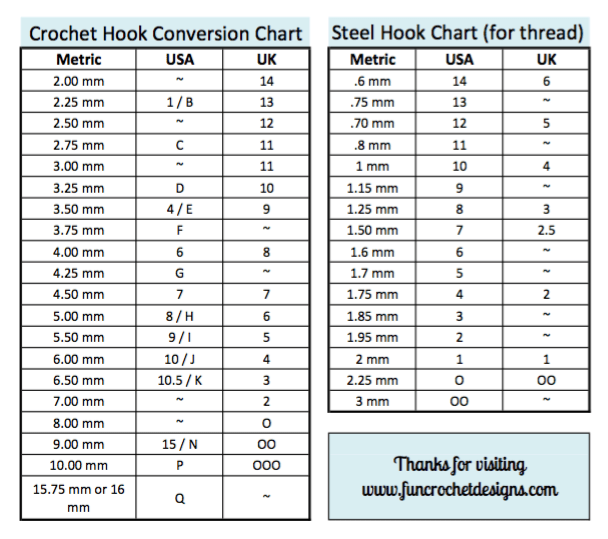 I inevitably have to look up that measurement and figure out which of my hooks correlates with that millimeter size. I used to get online every time I needed a conversion and look for a chart, then I finally got smart and downloaded a chart that I can keep on hand to reference quickly. I’ve made a chart for you to view here or download if you’d like to have one handy. Put it in your crochet basket with your current projects or in your pouch with your hooks so you never have to wonder which size hook you need again! I’ve included both USA and UK conversions. Here’s the chart I made just for you. Want to print it off and keep it? Just click the link to download a PDF that you can print off. You can open a PDF with Preview on a Mac (which comes pre-installed) or Adobe Reader on a PC which you can download for free if you don’t have it installed already.